The NYTimes recently did a nice job of boiling down the data from the Labor Department spelling out what types of services and procedures are generally covered by Health Insurance and which ones aren’t. 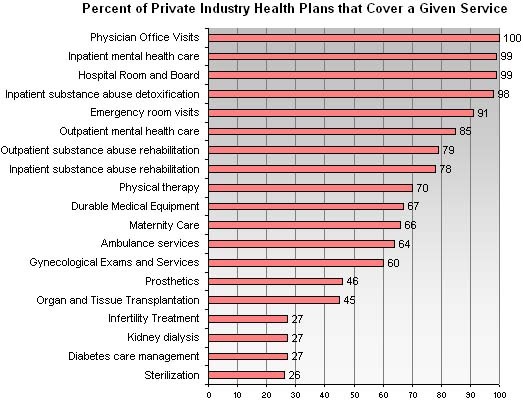 This is an interesting chart in that it may shed some light on your plan and how yours stacks up against what other Americans get (of those that actually have Health Insurance), as well as telling us about priorities in the Health Care system. First off, to be considered “covered”, it just meant that some portion was covered, not necessarily that the health plan paid it in full. In all, I was a bit surprised to see the LACK of coverage for certain services I would have assumed to be 100% (of some degree of coverage per nomenclature above). Maternity Care – I’m not sure exactly what this entails as it may be more involved than it seems, but by the categorization, I’m surprised only 2/3 of women receive what I’d assume is standard maternity care – ultrasounds, blood tests, etc. So, 1/3 of Americans with Health Insurance pay for Maternity Car out of pocket completely? Seems strange. Ambulance Services – This one is arguable. Occasionally, an ambulance call goes out when a patient could have just driven themselves, their kid or whoever, to the ER themselves. Some towns fine people for ambulance calls. Others argue though that penalties like this will dissuade people from calling when they really needed to, resulting in a tragedy. Tough call. Ob-Gyn Exams and Services – Again, surprised this is down at 60%. Why? Transplants – This was another surprise. Transplants are pretty rare, and last time I checked, people aren’t having organs transplanted for their own leisure. It’s usually so they can survive. I have to imagine paying out of pocket is probably a six figure expense as well. So, surprised to see this one so low. Dialysis – I would have thought this would be at or close to 100%. Without dialysis, many patients are either impaired or will die quickly. Strange that this was such a low percentage of coverage. Sterilization – This one was a surprise as well. Coming in at the bottom of the list was sterilization. I wonder if there’s some “religious” or political component to this. For instance, many Catholic hospitals still won’t tie tubes following delivery even if the mother (and/or husband) request it in advance. And we know how the political right feels about sterilization and abortions (different, but, well, similar goals). Let’s face it, it’s expensive to pay for maternal and infant care, which often are covered by insurance. 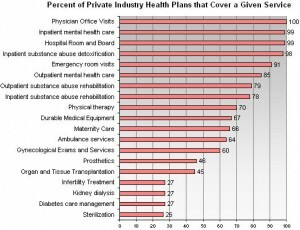 So, why would a plan forgo a preventative measure only to incur higher costs down the road? It’s kind of like not paying for vaccines or routine office visits when they are shown to prevent higher costs (and mortality) down the road. We also know there’s an inverse correlation with income and fertility rate throughout the world, US included. So, (often times), the families that can least afford another child are more often the ones having another. This is what the data shows, so please don’t jump on me for making some sort of ethical/political statement; just telling it like it is. Financially speaking, it wouldn’t make sense NOT to pay for sterilization, right? Based on what’s NOT covered, many people need to come up with constant side job ideas just to keep funding the annual increases in their premiums – it’s nuts! How’s Your Plan Stack Up? Are You Surprised By These Data? Politicos don’t want insurance companies to cover sterilization because they know it would greatly reduce the welfare state they pretend they want to end. I don’t think anyone should jump on you for what you said. The duty of the economist is to put a dollar sign where others might put feelings, there isn’t a button on the calculator for “how I feel about this,” so we can’t pretend that these aren’t important issues, nor ones that cannot be quantified. One of the few quality studies in Freakonomics was the abortion study, which, regardless of how you feel about abortion, did provide some serious data worth reading and considering. That Freakonomics data was really eye-opening. I didn’t cover abortion since it wasn’t on the list; but sterilization raises similar hackles, although you’re at least “preventing” the start of a life there rather than ending it. But as far as economics, impact to society, etc. the data was shocking. I’m of the train of thought that insurance should only cover disastrous unpreventable things (like the dialysis and transplants)… stuff that’s actually insurable to a degree. It makes zero sense for insurance to cover regular maintenance and care. That would be like you paying for your oil change with your insurance. There’s something to be said for the cost savings to be achieved if that’s all insurance covered. On one hand, if Obama had enacted a disaster-only type insurance plan universally, it would have been much more affordable. But then, you have that societal issue of two different classes of treatment. No easy answer, but from a cost standpoint, it’s clear that when something’s free or close to it, it’s abused. People go to a doctor constantly for the common cold, demand antibiotics (which are virtually never useful since it’s almost ALWAYS viral and rarely bacterial) and it’s all heavily subsidized. If you knew that visit and meds would cost $250, you’d tough it out and wait for abnormal symptoms to occur before wasting resources. The way I look at this is how much would oil changes cost if insurance paid for it? Probably double or triple once you account for overhead and insurance fraud. It would be easier for the poor to afford care if costs were lowered, but it’s hard to say since this goes back to Hazlitt’s unseen vs. the seen. I know that when I was an uninsured student dental care was maybe 1/3rd of the cost. Here in Canada waiting months and years for diagnostics and operations and having to pay out of pocket for many non-emergency treatments hurts the poor in many ways, as they can’t afford to fly to the U.S. or Thailand and jump the queues. If you want to get controversial though I think Robin Hanson has made the point that much of the costs are coming from people that are already close to dying and are trying to eke out a year or two more of life. Controversial, because if it’s your own grandmother, or your own child, you would want to do everything for them. I know I would. Whatever we wish, scarcity is real and a system based on voluntary exchange is better at allocating the resources to where people need them than a system with glass walls and ceilings preventing this exchange. What is fair about forcing people to suffer and die and legally preventing them from having a choice? Again, if it’s your own grandmother, you’d want to do everything for her. When it comes to medicine, why is it one-size-fits-all for the poor and freedom only for the rich? Mrs. RB40’s health insurance covered pretty much 100% of the maternity care. She was high risk so we had quite a few ultrasound and constant Dr. visits. They covered everything up to the hospital stay during delivery. The only thing they didn’t cover was after that. She had to have some follow up visits and they covered 90% (?). It was a great experience overall. We had a high risk too and got hit with a $30,000 bill when they claimed it wasn’t “medically necessary”. We were like, WTF! Her water broke at 31 weeks and she was confined to a hospital bed! They finally relented and paid; but it’s annoying they put you through these hoops when it was under a physician’s orders and you’re talking life and death. For maternity care, I’ve found that most group plans will cover it, and most individual plans will not (unless you have a special rider, which at its price makes no financial sense). The logic for insurance companies is supposedly that pregnancy is something you plan, not something that “happens” to you, so you should have to pay for it yourself. Again, these are generalities but basically what I found since my wife and I want to have more kids and we recently had to get individual insurance. Maternity? this is pretty much an elective isn’t it? why should “insurance” cover this? However, one problem with “insurance” as it it works in the US is that insurance companies negotiate very very cheap prices for procedures so that you can’t really afford the “list” price unless you have insurance. When you put “insurance” in quotes, you’re likening health coverage to a binary outcome like life insurance. It only pays off if you die. There are lots of shades of gray. Preventative medicine like checkups, screenings, vaccination and the like are voluntary as well. But they’re cost-effective and drive down costs to treat later, so it makes sense. When you say maternity is elective, isn’t it kinda necessary for the human race to exist? For you to exist? So, it’s actually necessary and common enough that you’d think it would be covered. Plus, aren’t there cost-preventing conditions that could be identified/treated early? Like at-risk births and the like? It just surprises me it’s not covered when you look at what is. The deal on maternity seems strange. Perhaps it’s the way the survey data was configured, and perhaps some plans offer a lower percentage of coverage, or lower rates if you’ve got *zero* chance of needing this coverage. 50% of the conditions you mention relate to women’s health care, specifically women’s sexual health care. I’m not sure what it is, but it seems like the health care/medical industry is predisposed to not caring very much about women’s bodies (ie, only performing trials for new drugs on men, without consideration of the fact that the ingredients may affect women differently) and it’s possible that insurance companies have followed that trend and made it a part of policy. I mean, honestly, when women’s OB/GYN visits aren’t covered and seniors struggle to pay for their heart medications, yet insurers will cover the cost of a Viagra prescription…it just looks like bias to me. Women’s cost of insurance is also consistently higher, the last rates we pulled about 2 years ago the difference for the same age group (no medical exam was required for this particular coverage) was something like 25-30% higher.